A breeze that hit 20 knots during the first two races of the day, and then 25 knots in the third, had the 18ft Skiffs flying in Portland Harbour yesterday (Sunday 30 June). With the breeze in the region of 16-18 knots when the boats were being rigged, just a quarter of the fleet elected to put up their No 1 rigs, including ‘RMW Marine’ sailed by Tim Robinson, Dan Johnson and Jonny Meers, while the remainder chose the No 2. Andy Richards, Andy Fairley and Dave Richards pulled off an excellent Port-tack start in the first race of the day, but the ‘RMW Marine’ team handled their big rig superbly, and established a lead which they held to the finish. The world class 49er sailors Alistair Richardson, Peter Greenhalgh and Harvey Hillary on ‘Red Bull’ finished second, with Jarrod Simpson, Grant Rollerson and Chris Cleary on ‘Ernst & Young’ third. The day’s second race saw Toby Collyer, Stephen Holmewood and Simon Rosier on ‘Helly Hansen’ lead round the first mark, but once again ‘RMW Marine’ powered into the lead and stayed there. Jon Bennett, Andy Jeffries and Nick Jerkins on ‘Computacenter’ mastered the boisterous conditions to take second position, with ‘Ernst & Young’ again finishing third. Having secured five straight wins, the ‘RMW Marine’ team decided to leave the rest to fight out the final race of the day, with the wind now hitting a steady 25 knots. The ‘Red Bull’ boys were enjoying themselves enormously, and did their utmost to win this race, but it was ‘Ernst & Young’ that took the victory ahead of them, with ‘Helly Hansen’ third. ‘Computacenter’ had a major sail problem near the final windward mark, when the clew of the mainsail became detached. Having had to retire from the first race of the series on Saturday, they doggedly carried on to the finish under jib only to finish last, but secure fourth place overall behind ‘Ernst & Young’ and ‘Red Bull’. 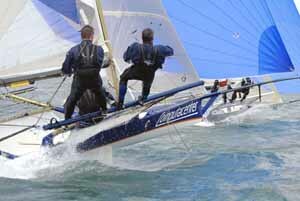 Round 4 of the UK 18ft Skiff Grand Prix will take place at the same venue in two weeks time.